This most commonly occurs following an injury to the tip of the finger, when the finger is stubbed and bent further than it should. This could happen following a simple fall on your hand, but very often is the result of the finger being struck during a ball game such as netball, cricket and football. In some inflammatory conditions such as rheumatoid arthritis it can occur with little or no injury. Often patients present late to a hand specialist thinking that the injury is minor and will settle. Patients may experience pain, swelling and bruising at the end joint of the finger. The fingertip classically droops downwards. On examining the finger, the joint can be corrected, only for it to droop down when let go of. The first step is to undergo a consultation, involving a medical history and clinical examination. Mr Naqui may organise further tests such as an x-ray. An x-ray can reveal if there has been an associated fracture of the bone and what the position of the joint is like. Treatment will depend on whether there is any fracture and how long ago the injury occurred. The first line treatment is usually to place the finger tip in a splint for a continuous period of 6 to 8 weeks which prevents movement of the end joint of the finger and allows the fractured bone or injured tendon to heal. 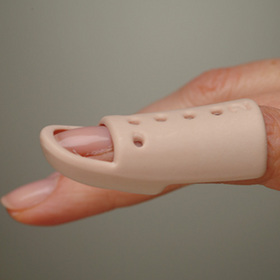 To keep the finger in a splint for this length of time requires perseverance. If there is a fracture and the joint is significantly out of position (subluxed), Mr Naqui may advocate surgery. The wire is usually left in position for 4 weeks, it is removed in clinic under local anaesthetic. Following splintage and tendon healing, you will be given formal exercises to regain full flexibility of the fingertip. Activities which stress the finger should be avoided for up 3 months. Mr. Naqui will discuss with you regarding return to sports depending upon your particular sport – as a protective splint could be worn to help you get back to sport earlier. Driving can safely be resumed at around 4 weeks. Return to work is dependent on the nature of you work but usually expected within 2 weeks if it is non-manual work. You can discuss this with Mr Naqui at your consultation. The main potential complications that will be discussed with your prior to gaining consent for surgery include recurrence of deformity, pain, swelling, infection, stiffness, scarring and numbness. In a proportion of patients tendon healing does not occur despite splintage and/ or wiring with a resultant re-droop of the finger. If this were to happen then there are further non-surgical and surgical options, which you can discuss with Mr Naqui.